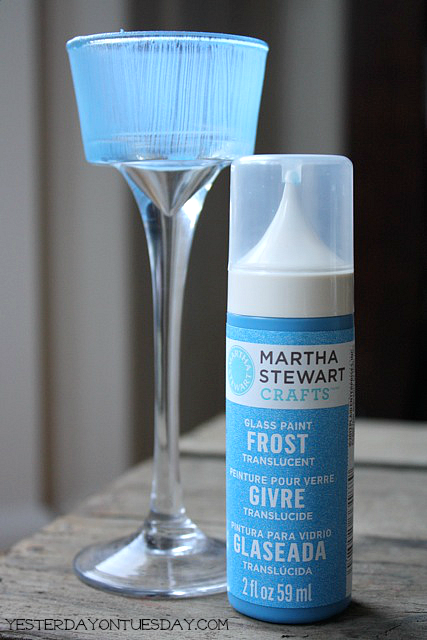 This post is sponsored by Blueprint Social and Martha Stewart Crafts. All opinions are my own. Find my disclosure page here. I was so excited to have a chance to work on a holiday project using supplies from Martha Stewart Crafts! 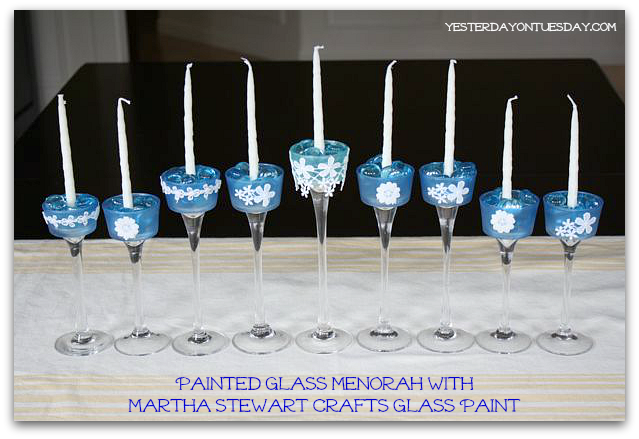 In our household, we celebrate Hanukkah– so I jumped at the chance to create a Menorah using Martha Stewart Crafts Glass Paint and Decoupage. Martha has anything and everything you might beed for holiday crafting with her multi-surface craft system including craft paint, glass paint, decoupage and jewelry. 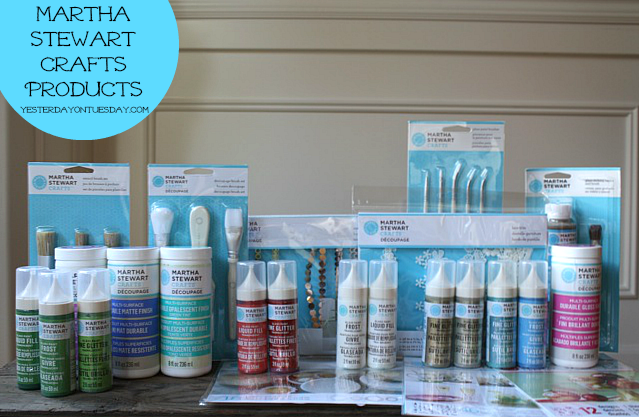 You can find Martha Stewart Crafts products in store at your local Michaels or online at Plaid Crafts. 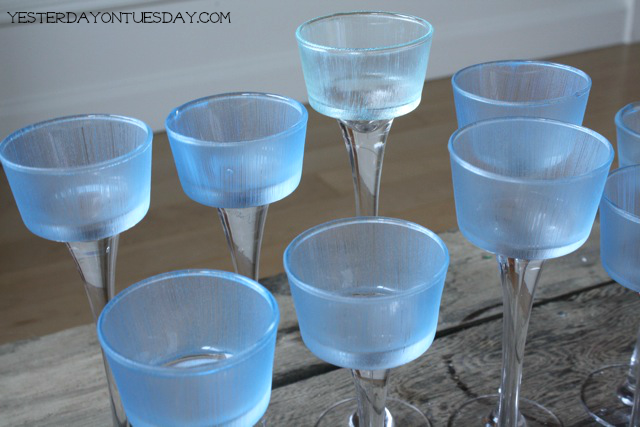 I started with some inexpensive glass candle holders and these awesome Martha Stewart Craft supplies. Here’s a shot of all the beautiful products I received. The items I used for my menorah were Martha Stewart Crafts Glass Paint Frost in Blue Calico, Martha Stewart Crafts Glass Paint Fine Glitter in Turquoise, Martha Stewart Crafts Decoupage Multi-Surface Durable Gloss Finish, Martha Stewart Crafts Decoupage Brush Set, and Martha Stewart Crafts Decoupage Lace Trim. Step One: I cleaned all the glassware with rubbing alcohol. Since I was painting pieces for a menorah, I needed eight candle holders and a ninth one for the shamash (lighter candle). 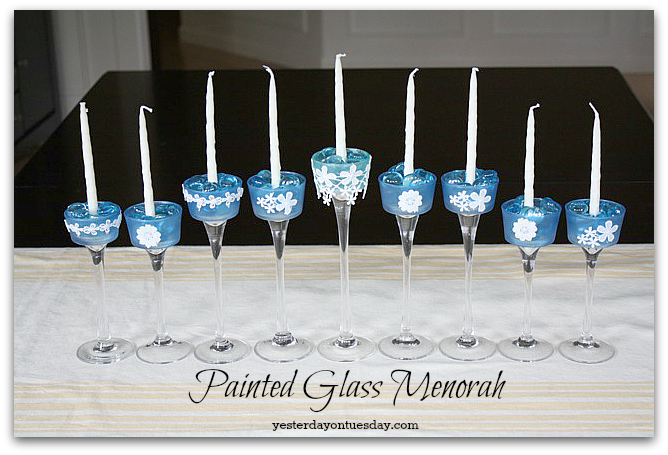 Step 2: I painted eight candles with Calico Blue and the shamash with Turquoise. I did five coats total, letting each layer dry. 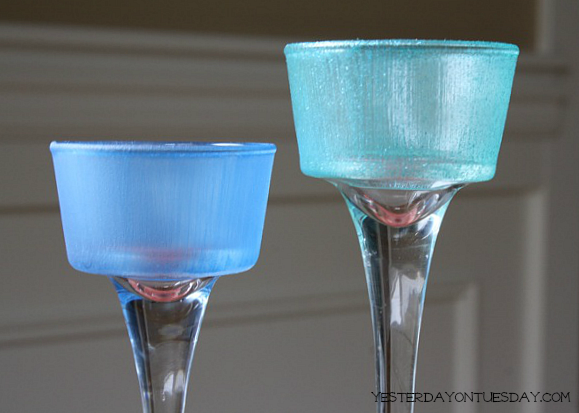 This is what the candle holders looked like after five coats of paint. 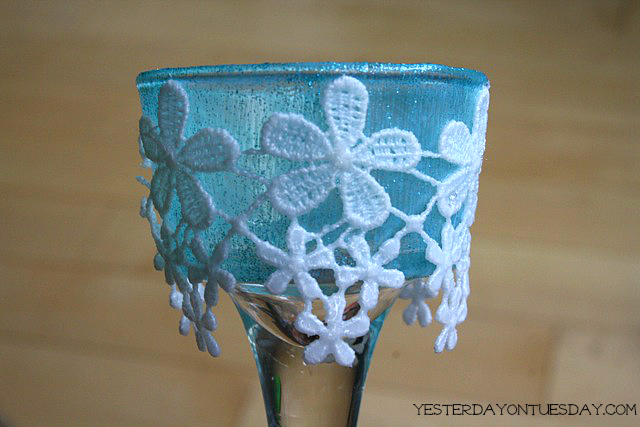 Step 3: Then I grabbed the lace decoupage and cut it into smaller pieces to embellish the candle holders. Step 5: Following the instructions on the bottle, I painted the entire surface with Martha Stewart Crafts Decoupage Multi-Surface Durable Gloss Finish, as well as the “back” of the lace bits. Then I adhered them and waited… and did more coats on top, letting each layer dry. Of note: Martha Stewart Crafts Decoupage is dishwasher safe. Follow package instructions. Here’s a closer look at what my glass looked like with all the goodies. Step 6: Then I simply added the candles! Happy Hanukkah… I can’t wait to show off my new menorah. Yea for Chanukah crafts! Your menorah is beautiful. I guess I should really be thinking of getting out the big Chanukah box from the attic soon…. I love the painted glass and the lace trim! Very pretty and festive! So pretty! We celebrate Hanukkah and Christmas in our house too, and I was just saying the other night that I need to do something crafty for Hanukkah this year! Yay Heidi, I am glad you celebrate both too! Happy Holidays!!! THis is so very pretty!!!! What an absolutely beautiful Hanukkah project, Malia! Thanks Jenn and Happy Hanukkah to you and yours! 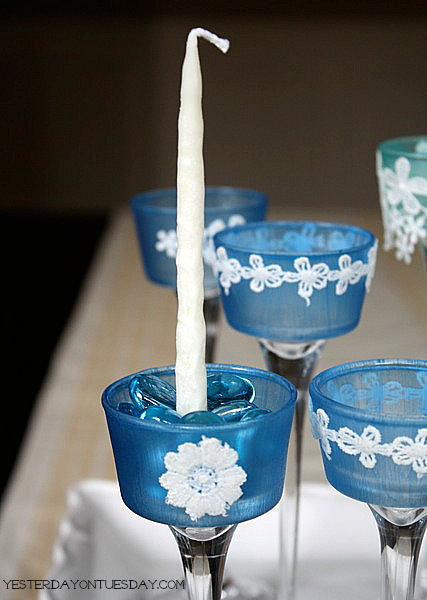 Your candle holders look so pretty with the blue paint and the lace – I love Martha Stewart craft products! Thank you Diana and Happy Holidays! This is so pretty and it’s fun to see some Chanukah crafts! Thanks Marissa, hope you are feeling well! Gorgeous Malia!! I love the touch with the flowers and the pretty color too! Pinned! Oh my goodness. This came out beautiful! And so special for your family celebrations. Thanks for linking up to Tickled Pink Times Two. Thank you Meegan… it’s on the counter already since Hanukkah is so early this year! This is a fabulous project! 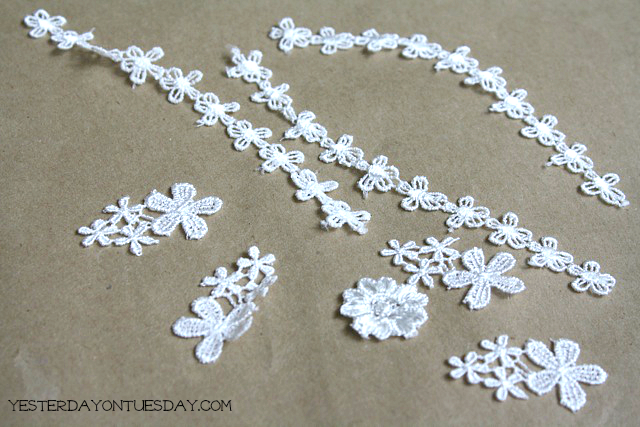 I love how it all turned out and your lace embellishments. Love! Thanks Molly! I sure appreciate you stopping by!